I have a love/hate relationship with this workout. I love it because it can be done in a short time with equipment that most hotel gyms have. Looking over my notes, I saw that I once did this workout on lunch break during interviews for Saltwater Experience. Because it is such a beautifully simple workout, it deserved a good name and that is why it is called Hanna. The workouts that get my kids names are always good ones and this one could be the best one I came up with and named for one of the kids. The dislike of this workout is obviously evident in about the 3rd hang clean of the 3rd round. All of the sudden you kind of realize that this thing is no joke. Today, I was pouring sweat heavily by round 2 and finished all reps unbroken until round 7. I then split the cleans 7/3 for the rest of the sets. My time today was 15:07 which is pretty good after looking at my history. There were several entries where I dropped weight after a while but there were also several entries where I used 50's instead of 45's. Ill take 15:07 though. This week is also my birthday week. On Saturday, I'll turn 49. At 49, I am extremely pleased with my physical condition and do not feel that I have stopped climbing towards further enhancing my strength, flexibility, mobility, endurance or speed. As an athlete in high school, physical fitness was just always there. When I went to college, however, that all changed and physical fitness was not anywhere on my list of priorities. I gained alot of weight, didnt move much and ate anything, literally anything I wanted to. At some point, I noticed a tire forming around my waist and decided that if I quit eating red meat, I might stay away from fast food a little and so I did that for a while. It was not effective as I drank more calories than I would have taken in through fries and milkshakes. During college I became a fishing guide in Jackson, WY in the summers. I loved it immediately and knew I would be doing this in some form for the rest of my life. Everything went into fishing and I never thought about fitness for a long time. While rowing, I sustained my first back injury ever and tried to resolve it in different ways. Finally, I went to a chiropractor who helped me right away. I was fascinated that his care could have such a major effect. How had I not heard about Chiropractors before? He also told me about core strength and how that could help to avoid injury in the future. As I became a saltwater guide, I found it hard to stay on the water all day without becoming overly tired. This was simply a matter of paying attention to my diet and mostly my hydration levels. Once I was drinking adequate water and covering up with clothes, I was doing much better. It was these little things I was learning that were making a huge difference in my life and my business. All of the sudden I saw that if I was fit, strong and healthy, I could go longer and for more days than I had before. This meant more money in my pocket. I decided that I would regain my fitness. This was about 23 years ago. Running occupied my fitness for many years and then I found more of what we are doing today. This year, I read a book called The One Thing, by Gary Keller. This is an excellent book and I HIGHLY recommend it to anyone. It's basic premise is that you examine what you are trying to do or accomplish and chose the ONE THING that will make everything else unnecessary or that makes everything else either much easier or possible to begin with. I think about this daily and prioritize my schedule to accomplish the biggest things first. Rusty and I were talking about this book and he commented that he thought the one thing was physical fitness and health. With it, everything else is easier and possible. Nothing is impossible. Without it, everything is more difficult or impossible. Paying attention to your health as the main priority of your day, every day, is the one thing that will keep you going towards success in any endeavor. It is 10:50 am and I have been working at a serious pace since 7:30 am. So far, we have run 11 miles, 3 sets of stairs, 5 runs up the steepest hill in town, 30 burpees, 30 clap pushups, 200 weighted pullups, 400 weighted pushups, and 600 weighted squats (2 Murphs and a bunch of running). I have already consumed and sweated out over a gallon of water, but right now, I am just staring at a barbell and wondering if I can pick it up. The barbell was 155 pounds and was the single implement to a classic CrossFit hero workout called DT. It is simple, effective and punishes athletes who have neglected olympic lifting strength in favor of endurance or gymnastics. DT is hard for me when fresh, and I am anything but fresh right now. I have logged 8 results on the Whiteboard for this workout, each with steady improvement from the time before, but it still hurts…a lot...every time. This is precisely the reason that I find myself just staring at a motionless 155 pound barbell in my driveway at this moment. It was there for a reason, a serious challenge placed strategically within a long workout to see how we would react. I walked around a bit, drank more water, even changed shoes and tried to find the switch in my head that would allow my mind to overtake my body but it was hiding. Finally, I decided that I would try to complete just the deadlifts. I did 11 deadlifts, but each one was brutally hard for me. My hip flexors were screaming, my knees creaking and my entire upper body revolting in pain. It was heavy, really heavy. After a break, I decided to try to deadlift the final rep and go into the hang cleans. I was barely able to hold onto the bar for 8 reps and dropped it. I did 8 because I knew I would have to clean it the 9th time to get to the jerks. Patrick was next to me and started on the cleans. He was not able to clean the weight and quickly dropped to 135 pounds. Keith dropped to 95 pounds and was on the other side of me. (I am a little ahead of Patrick, Mike and Keith in Olympic lifting. To my knowledge, none of them had done a DT at 155 lbs so they scaled back to the weight that challenged them equally to my 155 lbs.) Doubt crept in. I did not think I could complete this workout at 155 pounds and thought that I would also drop to 135 pounds. Matt Green was my swim buddy and he is very strong. Matt would have no trouble with this workout so I decided to try the Jerks and just make it through 1 round before reducing the weight. I picked it up, cleaned it and managed 6 ugly jerks before dropping. 1 round complete. Matt grabbed the weights and moved them like a PVC pipe. Feeling better, I decided to give the deadlifts for round 2 one more shot and completed them. “Ok, that went ok, so Ill try the cleans.” a voice said inside my head. Surprisingly, I did get 8 cleans. Then the Jerks. It was heavy and I really didn’t think I could do it, but kept chipping away. Any concern over the amount of time it would take me to finish was gone. This was survival. Before I knew it, I had turned the corner from serious doubt to acceptance that I was not going to reduce the weight, but complete this as written. Finally, I found the switch. This moment was the best part of the day for me and the entire purpose of this extreme workout for all of us. Rarely in today's society do many have the opportunity to voluntarily face something that looks impossible and choose to take on the challenge. For some people this impossible challenge may have been a 5k run, a yoga class or a single Murph. I can certainly remember the first time I ever saw "Murph" written and wondered if it would be possible for me to complete it. “Could I possibly Run a mile and then do 100 pull-ups, 200 pushups, 300 squats and run another mile all while wearing a 20 pound weight vest?” I wondered. Eventually, I did complete a few Murph workouts had our confidence much higher and we later strung 2 of them together, then we decided to do a Triple Murph for my 45th birthday. We continued adding to the challenge with the hope that we would have the opportunity to be in exactly the same position as I found myself this morning while preparing to lift 155 pounds. Each of those challenges were completed and with each victory came increased confidence that we could use that experience to accomplish anything using the same strategy as Murph, Double Murph and Triple Murph. The way to get through all of those is simply one rep at a time. Never quit, never look at the entire workload, never get overwhelmed. Simply do one more round, one more pullup, one more pushup or one more squat and soon, you will have accomplished this giant thing that seemed like a complete impossibility just 2 hours before. SealFit Kokoro taught me that at the moment of doubt, we are capable of 20x more than we think we can do. With this philosophy, I have been able to start businesses, win tournaments, build teams, lead my family and make it through 50 hours of training on a cold California beach at an intensity similar to today’s workout. DT, however, presented a slightly different challenge for me. Most of the other challenges were endurancerelated but upon picking up the weight, I did not seem to be physically strong enough to complete 1 round, much less 5 rounds. I had done this workout many times before but always fresh. However, I began to think that if I could do it fresh, there was no reason that I couldn't do it now and I broke it down in my mind as to how this could be possible. While a 155 lb hang clean or Jerk is very heavy for me, a 155 lb deadlift is not. So, why not just get the deadlifts out of the way and then see how the cleans go. If I had focused only on the cleans or become overwhelmed by the looming 5 rounds, I would have given up right then. Once the deadlifts were complete, I didn’t rush it. I dropped the weight on the ground, got some water, chalked up and tried the hang cleans. As with so many other things, what seemed like it was going to be impossible actually wasn’t. It was certainly difficult but not impossible. Soon, I was chipping away at a goliath obstacle one rep at a time. The turning point to this stage of the workout and to so many things in life was when I committed to completing this workout. No more thoughts about reducing the weight. It might be slow and ugly, but the work was going to be completed if it was the last thing I ever did. This is the key to accomplishing anything of value in life and this lesson is amplified in training through sweat, grit, pain and misery. These same feelings are available when starting a business or making a difficult parenting decision, but they are never more clear or obvious than when using your mind to overcome the storm of pain going on inside your body to complete something that seems physically impossible. It is a cathartic experience. With a piece of sidewalk chalk I made another hash mark on the driveway; four rounds complete…I knew I had it. The last and final round felt better than the first and I was more confident than at any other time of the morning. It didn’t matter if it was ugly or slow, I was going to finish one rep at a time. At 11:16 am I dropped the barbell onto the driveway for the final time and felt a sense of accomplishment having faced the challenge and pushed through. I still had a mother of a workload to go to complete today’s workout but it was all downhill now. My mind was right, and nothing would stop me. The experience of overcoming this doubt in myself was worth this entire year’s training and I gained as much out of it as finishing SealFit Kokoro. As I accumulate more experience, it becomes harder to achieve a cathartic experience such as this. So to answer so many of my friends and relative’s questions about “Why are you doing this?” That is why. Today…mission accomplished. The official start time was 7:30 am, but a few people got started earlier. Several of the early starters chose to do just a portion of this workout while a couple just got a head start. 7:30 am- Strapped with 20 lb vests or rucks, we left on the first run of the first Murph of the day. This Murph was done with a 20 lb vest and non partitioned. This means that we had to do 100 pullups before we moved to the 200 pushups and complete all of those before we move to the 300 squats and then go on the mile run. All of this is done with a vest. Non partitioned is definitely the hardest way for me to distribute this workload, it was nice to get that out of the way first. This Murph took me 41:02 to complete. 8:11 am- We drop the vests and pick up a Camelbak full of water and run 1 mile to the Normal Park Stairs. This is a common workout for us that includes running, burpees, clap pushups, and stairs. We simply run 1 mile to the stairs, run up them, do 10 burpees at the top, 10 clap pushups at the bottom and complete this 3 times before running back to the garage. Today, we took a left out of the stairs instead of a right and ran to another common workout destination for us. is 2 miles. We ran 2 miles from the stairs to the bottom of Kent Street, behind Publix and then started in on the Kent/Hartman workout which is 5 rounds of running up Kent (the steepest hill we could find in town) and down Hartman. When finished with the 5 rounds, we ran the 3 miles back to the garage. 9:30 am- We return to the garage and put the vests back on to start our 2nd Murph of the day. This Murph is the same as the first with a 1 mile run, 100 pullups, 200 pushups, 300 squats and run 1 mile and was done with a 20 lb vest, however, the reps were partitioned. A partitioned Murph means that you can break up the reps in different ways to get the workload done as you like. The most common way is probably a 5 pullup, 10 pushup, 15 squat round done 20 times to complete the work followed by a run. Others may like a 10/20/30 x 10. I did the 5/10/15 x 20 on this 2nd Murph and I was back to the garage at 10:23 am. I did not cramp the entire workout. I was sweating heavily but the air was drying my skin off on the runs. The tell tale sign that I was not drinking too much was that with over a gallon of fluid taken in before 10:30 am, I had not peed yet. I didn’t pee until 1:30 in the afternoon. 10:49 am- 2nd Murph Completed and the vests are dropped, another coconut water drank, 1/2 a gatorade and I started on my second gallons of water. I left for the next phase which was Woodhill street where we simply run up and down a steep hill 8 times. Woodhill is about 1/2 mile away and when I got there, I started on the 8 rounds. I was able to run up and down the hill most rounds but did walk up a few times. When finished, I headed back to the garage and arrived at 11:16 am. 11:20 am- Changed out of the running shoes and into a training shoe to start DT workout. This was also a good strategy to avoid having to pick up the bar for a few minutes. I have no record of the time at the end of DT- DT was complete and it was time to move on to the next phase. I named the next one "Mike" and the one after that "Drew" for our friend Mike Drew that is moving. Mike is a team workout where the team of 2 has to complete 25 burpees, throw the waterball over the shoulder 5 times and do a 2 man 700 lb tire flip x 5 rounds. I was ahead of my swim buddy by a few minutes so I went ahead and knocked out the 25 burpees and 2 waterballs. He finished the waterballs and then helped me flip the tire. We broke up the burpees 10/15 and alternated each round. We made it through the 5 rounds and moved on to the next phase. I did not look at the clock at this point. This was the easiest portion of the workout for me because we could take it slow and just get through it. The bike was actually very nice to move the hip flexors and helped me to feel better. I made it through the rest with the rowing being the most painful for whatever reason. At this point I was almost finished with my full gallon of water as well, putting me at about 350 oz so far. I was sweating heavily and felt good. No cramps at all. I still had not eaten anything. Michael Lebovitz brought 2 dozen Krispy Kreme doughnuts for us and as I was leaving for my 3rd Murph, I grabbed 3 of them. As it turns out, I like running while eating doughnuts. It is fun. There was some walking on the 3rd Murph for sure, but I was able to get moving and run down the hill despite serious argument from my knees and hip flexors. Once back to the garage, I drank as much water as I could get down, 1 gatorade, 2 Endurolyte pills and dunked my head in the ice bath. I looked at the bar and wondered if I was going to be able to complete it. The first 5 rounds of the final unweighted, partitioned Murph went brutally slow and were painful. Everything hurt. I was light headed and got an Rx bar from the garage which was the first thing I ate besides the doughnuts. While there, I grabbed another doughnut, why not? I had not had sugar in 3 months and these things were delicious! I took a bite, did some pullups and completed a few rounds while chewing. More water, the doughnut and Rx bar down the hatch and I felt much better. 10 rounds in, I felt better than I did on the first Murph. 15 rounds in, I kept drinking and going 1 round at a time until I was ready to mark the final round of 20 with my sidewalk chalk. I grabbed 2 more doughnuts and dreamed of the ice bath that I was going to sit in after this final run. You could call it a run, but it was more of a walk/limp at this point. I ran downhill after being passed by Patrick St Charles who looked about as fresh as he did on round 1. I made it back to the garage at 12:57 which was about 20 minutes longer than I had forecasted for this workout. I thought that was pretty good. It's over! 5 of us finished the entire workout! 5 of us finished the entire workout. Patrick St. Charles, Keith Gray, Mike Drew, Matt Green and me. Many others completed parts of this monster and all had personal records for volume. Excellent job to everyone! I sat in the ice for 10 minutes and finally had to pee at about 1:30. I kept drinking water until I was peeing regularly through the afternoon. I laid on the couch for a while and watched Shark Tank. It was on and I did not have the energy to change the channel. After a while I moved to the floor because I couldn’t get comfortable and finally to the bed for an hour of rest. 5:30- Party at Rusty's with Beer, BBQ, Banana Pudding and good friends. I looked around and enjoyed seeing everyone communicating on a different level than in the dark at the garage. I am so fortunate to have so many good friends and it was so nice to see wives and kids all getting to know one another. They all had good conversations wondering why their husbands or dads were so crazy. Next Day- I took the day off and slept til 8. This really helped the recovery. I was slow to get out of bed, but I felt better than I thought I might. My ankles, knees and hips were arguing with me but I made it out of bed and started moving around. Lower back tightness and the standard soreness from doing over 200 pull-ups was definitely there, but I felt pretty good. I started drinking a lot of water early and followed that with coffee and my vitamins. I didn't feel like eating anything right away. After walking around for a while, I felt much better. Life called and I had to take my son’s boat to the mechanic, mail some packages and go to work. I took my son, Hayden who completed his first Murph the day before, to Whole Foods for lunch and indulged in way more carbs than normal. Mashed potatoes, Lasagne, fried chicken, plantains and whatever else looked good went down the hatch chased by a Turmeric milk and another 64 oz of sparking water. By now, I was feeling really good and went home and took a 10 minute ice bath followed by another 5 minutes about an hour later. Light stretching and more water had me ready for a dinner date with my wife and friends at 6:30 pm. I was even able to stay up and watch an episode of the 3rd season of Bloodline with my wife. That show is awesome. We concluded with some breath work and 10 minutes of still water meditation. Official start time 7:30 AM. Warm up before. Chattanooga Chase is coming up Minnekahda Place so park cars IN the driveway or well off the road NOT on hairpin turn. The first runners should come up the hill around 8:10-15 am. Notes: This is an extreme workout. Everyone is welcome to do the entire workout or drop in for any portion of it. It is not necessary to commit to the entire workout. Make sure any guest has signed the waiver. -Make sure you have a swim buddy. Stay with your swim buddy. -Carry a phone on the runs. -Bring all food and water that you need for the entire workout. I plan on having 1.5 gallons of water ready at the start of the workout and some electrolyte replacement on hand as well. You may need a ruck or Camelbak. -Take care of your hands and feet. return to RRL—rest if necessary. Party at Rusty's at 5:30 PM BYOB. Loads of RRL Ice, BBQ, Banana Pudding, Desert, Carbs, and all ingredients for an epic cheat day. I don't complain as much because I've become so grateful of the things that I do have, and I've learned that "it could always be worse." This time, we are going to discuss a recent event that Jonathan and a few others took on and completed. This event is called a Triple Heavy or HHH and it is put on by Goruck. A Heavy is 24 hours of work and many train for a long time to be able to complete one. Jonathan decided to try to do 3 of them...back to back to back. Something like this is going to be a crucible experience and it is only going to be completed by someone who is physically prepared and mentally for everything that is to come. Tom Rowland: Hey Jonathan- Great to catch up with you. I am so excited to hear about your HHH experience. Because a lot of other people will be reading this, lets go over a few things to make sure everyone understands just what an HHH is. Can you give us a little background on the different Goruck events and the difficulty of each? Cliff Notes version is fine. JH: The GORUCK Challenge is a team endurance event based on Special Forces training where participants undergo a variety of boot-camp exercises and team-building challenges while wearing a backpack full of weight. It tests your physical and mental abilities and is designed to make you work as a team, usually with people whom you never met before. There are three types of Challenges that vary in length and difficulty. There's the GORUCK Light which lasts about six hours, the GORUCK Tough which lasts about twelve hours, and the GORUCK Heavy which lasts at least twenty-four hours. There's also Selection, GORUCK's hardest event, that's forty-eight hours and is not a team event like the Challenges. The pass rates for Lights and Challenges are above 90%. The pass rate for Heavies is around 50%. The pass rate for Selection is less than 5%. Tom Rowland: How many Goruck events have you done? JH: Including the Triple Heavy (HHH), I've completed twenty-nine Challenges. Tom Rowland: So a Heavy is 24 hours and at one time the hardest event in the lineup outside of Selection and you decided to do 3 of them back to back to back? Why? JH: After failing to complete GORUCK Selection 015 in 2014, I was going to attempt it again the following year. I tore my calf during training in early 2015, which ended my hopes to attempt Selection that year. However, an opportunity came to do a new event called the Triple Heavy later that year. It sounded dangerous and unprecedented, but I ultimately signed up because I'd figure it would be good prep for Selection in 2016. I was also curious to meet the other people who were crazy enough to attempt three consecutive Heavies. Tom Rowland: Has anyone ever done a HHH before? What is the history of the event? JH: The Triple Heavy is a custom GORUCK event created by Doug Otte. Previously, the GORUCK HTL (which is a GORUCK Heavy, a GORUCK Tough, and a GORUCK Light done consecutively) was the hardest team event GORUCK offered. Doug was inspired by the HTL to create what he considered to be the ultimate team event, the HHH. Seventeen started the first GORUCK HHH in 2015, and seven (including myself) made history by being the first team to complete back-to-back Heavies (GORUCK HH). The third Heavy was canceled due to low participation numbers, as only four were willing to continue and five were needed. I was the swing vote to determine whether the Triple Heavy would continue, but I decided not to proceed because of a thumb injury I suffered near the end of the second Heavy. We all vowed to come back for HHH02 and finish the event. Tom Rowland: Did the reason for doing the second HHH change from doing the first? JH: Yes, it did. I did the first HHH event for Selection prep and a desire to meet the other HHH teammates. For the second HHH, there was a feeling of unfinished business after how the first HHH ended. But my primary reason for doing HHH02 was to inspire others by showing them that what is considered impossible may not actually be so. Finishing three consecutive Heavies had never been done before, and I strongly felt that it was indeed possible and the HHH02 team would be the one to do it. Tom Rowland: Since the HHH is a team event, how did you decide who you would do the event with? JH: The first HHH accepted anyone who signed up. The second HHH had an application process, with input from the GORUCK HH finishers if needed. Finishing an HTL was an important requirement, but exceptions were made if a person had similar experience (like finishing Kokoro). Tom Rowland: Who were your team mates? JH: The team was a mix of people whom I have done previous GORUCK events (including the first Triple Heavy) and some I had never met before. One was even a cadre from the first Triple Heavy, Chris "Soul Crusher" Sanchez! Tom Rowland: So now we understand the motivation and the events, this is where the rubber meets the road…how did you train for the event? How long did you train for it? JH: After the first HHH ended in late September 2015, I took October off to recover. I started my training for the second HHH in November and I already had a major event coming up. The calf injury I mentioned previously also took me out from doing Kokoro (a 50-hour endurance crucible based on Navy SEALS training) in early 2015, so I rolled into the 41 class in February 2016. Thus, from November through February, I trained to get ready for Kokoro 41. I mostly followed Stew Smith's Complete Guide to Navy Seal Fitness during that period, although I wished I did more running. After finishing Kokoro 41, I took March off to recover. A good friend of mine, Troy Angrignon (also a Kororo finisher), helped devised a HHH training plan for the rest of the year. I followed variations of Strong Swift Durable training programs, specifically Fortitude, Valor, GORUCK Selection, and SFOD-D Selection, but I didn't follow them too strictly. For example, the SFOD plan had 80# ruck training days, which I felt were too excessive for HHH, so I scaled them to 60#. I also did a bunch of GORUCK events throughout the year, including the GORUCK Triple Light. However, I didn't do any HTLs this year, as I felt that finishing Kokoro in February was enough in terms of big events. I was worried that not doing at least one HTL before the HHH would be a mistake, but it ultimately worked out. Tom Rowland: What kind of communication did you have with your team during the training? Did you ever get to train in person with your team? JH: We used Facebook to communicate with each other for the big things like getting the correct items for the event and hotel accommodations. For those whom I knew prior to HHH02, I either communicated via Facebook Messenger or on the phone. I would see some of my HHH teammates at other GORUCK events, so we'd talk about the event then as well. I mostly trained alone, although I did a few workout sessions with a good friend and HHH teammate, Roman Hunt, since we lived in the same area. Tom Rowland: How did this training differ from SealFit Kokoro? JH: It was less running and more rucking. Pull-ups weren't a big concern, although I still worked on my push-ups since the Heavy does have a PT test. The goal was to get used to rucking a lot of miles with heavy weight. One of the modifications I did that wasn't in any training plan was a heavy ruck session that I did once a week, where I did three rounds of one mile with a 45# (and later 60#) ruck and a 60# sandbag. Ruck PT was also important, and one of my "favorite" sessions was to bear crawl with a 45# ruck around a basketball court for a few laps. Tom Rowland: Tell us about the event? Where was it held? Temperature, weather? JH: HHH02 took place in San Diego, CA from September 29th, 2016 to Octobet 2nd. It was sunny and hot during the day and not too cold at night. We visited a variety of places, such as downtown San Diego, Coronado Island (including the North Island Naval Air Base), a Crossfit gym, Fiesta Island, the desert in Anza Borrega, and ended at the USS Midway. Tom Rowland: What did you choose to wear? What about socks and footwear? JH: I wore a cheap Champion athletic shirt, Triple Aught Design recon pants (which sadly ripped during the second or third Heavy), compression shorts, and a Columbia windbreaker when it got cold. My footwear consisted of Injiji toe socks, Darn Tough Merino wool socks, and Brooks Beast '14 sneakers. I was considering boots for this event, but I would develop issues with my right ankle whenever I trained in them. I ultimately decided to go with what I was comfortable training in, so I used the same brand of sneakers I wore for the first Triple Heavy. Tom Rowland: Walk us through some of the highlights. JH: 1st Heavy - Taking a ferry to Coronado Island and enjoying good old surf torture at the beach. Later on, while walking in the surf, I got stung on my right toe by a stingray or some other animal. My foot hurt like hell, and I remember Cadre Brett Vernon sarcastically asking me if I wanted to med drop. I was temporarily a GORUCK causality where I had to be carried on a tarp for a bit, but thankfully my foot got better and I could move on my own again. Later on, we were granted access to the North Island Naval Air Base in Coronado and got to see the SERE school. I'm grateful that we had the privilege to visit it (and also grateful that no SERE interrogation techniques were used on us). Kirk Deligiannis in SealFit 45. RIP Brother. We will always remember you. 2nd Heavy - The PT test for the second Heavy took place at Crossfit ATR, and we did the "Doc" Hero WOD (in honor of Charles Luke Milam). Afterwards, we were surprised with a bonus memorial WOD for Kirk Deligiannis, who was an amazing member of the GORUCK community and sadly passed away after finishing Kokoro 45 a week before the Triple Heavy. 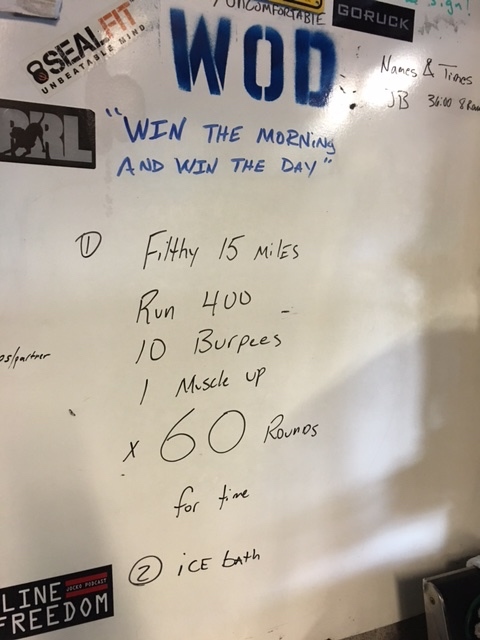 Teammate Kim McGrath was instrumental in having the HHH team do a WOD in his honor, and we both were given an opportunity to talk about him before we started. The class yelled, "For Kirk!" before we started his WOD. We also were honored to have a veteran from Operation Gothic Serpernt, Steve Lycopolus, speak to our class. This was significant since the HHH was also Mogadishu Mile themed, and to have someone who experienced the event we were commemorating made it extra special. We ended the second Heavy at Fort Rosecrans National Cemetery. Unlike last year's HHH, my thumb was still intact at the end of the second Heavy, so I looked at Kim (who finished the HH with me last year) and told her I was ready for Round 3 while wiggling my thumb. 3rd Heavy - We began in the desert of Anza Borrega. I was worried about how dry and hot it was, but the third Heavy didn't start until the sun was already going down (making the temperature thankfully cooler). Nonetheless, that start was intense because we were expected to work strong and hard despite having done two consecutive Heavies. We were nearly ruck running up a mountain and we lost three teammates in the first 90 minutes of the event. Near the end of the event, we had to do peer evaluation of our other teammates. It was really interesting to hear what your teammates had to say about your performance throughout the event and provided an excellent learning opportunity on how to improve as a team member and leader. And obviously, the endex, which I'll talk about later. Tom Rowland: On an event like this, there are going to be some major highs and some major lows. Can you describe the darkest moment and tell us what you and your team did to overcome and get back on track for success? JH: The darkest moment for our team came during the second Heavy. We were supposed to infiltrate the San Diego Challenge class that was happening at the same time, but we kept failing for a variety of reasons. We were exhausted (this was probably around Hour 40 or so into the event) and weren't gelling as a team. The repeated failures put a damper on our mood. The end of this evolution provided a nasty gut punch with the loss of two team members, including Cadre "Soul Crusher" who had to be med dropped. We were given an opportunity to nap for about 15 minutes or so. The combination of a brief rest plus the sun coming up allowed us to recharge and essentially start with a clean slate for the next evolution. We worked better as a team afterwards. We had another rough patch around Hour 70 during the third Heavy. Our team was down to eight and we were having troubles working together as the cadre put a lot of stress on us and our team leader. It took a while for me to realize that the cadre were actively trying to make us turn on our team leader. I wished I had realized this sooner, and I'll discuss this more in detail when I get around to writing my After Action Review for the event. We eventually rallied around our team leader to get past this evolution, but I look back at this moment as a failure of leadership in my part and an unfortunate learning experience because I could have done better for my team. Tom Rowland: Now that it is complete, what do you see as the most challenging thing to completing a single Heavy…how was it different to complete 3 back to back to back? JH: If you never completed a Heavy before, you wonder if you can survive putting in work for twenty-four hours straight. Sometimes your food gets taken away and you have no idea when you'll have a chance to refuel. The long grind and sleep deprivation create a daunting atmosphere, but it's one that can be conquered if you trained hard and have the right mental attitude. For the HHH, food wasn't an issue since there was an expectation from the Cadre that we would never be denied food since doing endurance rucking for three straight days required a lot of calories. After finishing one Heavy, the major issue is whether you think you have enough will power and strength to continue for another 24 hours. To combat this feeling, I essentially treated the HHH as one long eventAlthough I still celebrated the victory of completing each Heavy, I considered those ends as breaks rather than the end of one event and the start of another. JH: The first break between the first and second Heavy was tough because I was unable to sleep. I don't know if it was because of the food I ate, or my inability to be comfortable in the outside grass, but I couldn't take a nap and ended up laying with my eyes closed until it was time to go. I presumed that the cadre would warn us before the second Heavy start, but that didn't happen and it was stressful to collect all my unprepared belongings before we had to move to the next location. We all learned our lesson at the next break between the second and third Heavy. We made sure that our packs were ready for the third Heavy before we took our naps. I was able to rest a bit, and sure enough, our prep paid off because we were told to immediately move once the third Heavy started without notice. Tom Rowland: How did you feel when it was over? JH: The HHH endex was an amazing experience. We finished near the kissing statue outside the USS Midway. Members of the GORUCK community and teammates who had dropped from the event were there to cheer us on and congratulate us as we finished. Seeing that support as we arrived lifted our spirits, especially since it signaled to us that we were finally about to end. Getting the HHH patch was one of the best moments of my life. First, the accomplishment of completing something that I was unable to do the year before provided a great feeling of vindication. Second, being able to show people that nothing is as impossible as it seems was satisfying. I truly hope that our HHH victory would inspire people to pursue their goals. JH: I slept a normal eight hours after the event, which was surprising. When I had to walk around the following day, I limped. The day after that, I stayed in bed. When I went back to the gym, I avoided using any weights and mostly kept to stretching the first two weeks after HHH. Unfortunately, I have a lingering injury on my right leg that was exacerbated by the HHH, so I'm still not at 100%. I've mostly been doing upper-body bodyweight work and swimming to stay off my leg, and I'm about to start physical therapy to rehab my right leg. JH: One of our HHH teammates, Kelli, who dropped during the second Heavy brought Jack in the Box burgers and fries to the endex. She is a saint for doing this, and I will be forever grateful for her generosity. The Chipotle run after the event was also fantastic, and I appreciate Pete Silver for driving the team there and then back to our hotel. I joked with my friend and HHH teammate, Patricia, that Chipotle was the food of champions since we ate a burrito the day before our Kokoro and HHH events and we finished both events. Is there a Quad Heavy in the future? JH: No. The Triple Heavy was already on the edge of excessiveness, and anything that goes beyond that is too much in my opinion. I wouldn't be completely surprised if someone comes up with something dumb like GORUCK HHHHHell Week in the future, but I won't take any part of it if it ever exists. You would have nothing to show for it except for some really stupid injuries. Tom Rowland: So now you have done a number of Goruck events as well as completing SealFit Kokoro and HHH. What lessons have you taken back to your everyday life? JH: Mental attitude plays a big role in how you will succeed or fail. You have to be absolutely confident in what you are doing. When I first attempted the HHH, my attitude was that I would finish two Heavies and see how far I could go for the third. Lo and behold, I only made it as far as two Heavies in HHH01. For HHH02, I changed my attitude and repeatedly visualized myself finishing the third Heavy with my teammates. One of the main reasons why I completed the HHH was because I absolutely believed that I could finish it. I used the same visualization techniques to see myself completing Kokoro, and that played a role in becoming a Kokoro graduate. I don't complain as much because I've become so grateful of the things that I do have, and I've learned that "it could always be worse." Completing those events also warped my perception of what is difficult. Any challenge that stands in my way doesn't seem as scary as the stuff I've been through in Kokoro and HHH. Tom Rowland: I am a graduate of SealFit Kokoro 30 and I attempted Goruck Selection 015 in your class. I saw great similarities between the two events, but I also saw them as almost the opposite of one another in so many ways. Successfully completing Kokoro gave me great confidence and I brought tons of lessons home and became better for it. Failing after around 20 hours in Selection 015 also taught me a ton of lessons. In so many ways, I learned and gained more from the failure than I did from the success. Can you give us some insight to how you would compare and contrast the HHH to SealFit Kokoro? JH: Reliance on your team members is a big factor in both Kokoro and HHH. I would not have completed either event if it wasn't for my teammates. In terms of difficulty, the Triple Heavy was harder than Kokoro. It seems obvious saying that because the HHH's 72 hours is greater than Kokoro's 50 hours, but I'll never forget how intense it was to be expected to perform again during the third Heavy when you already had done so much in the previous 48 hours. Kokoro was more than just a test of your physical and mental limits--it was also designed to provide lessons that allowed you to find or reflect on the purpose of your life. The Triple Heavy, on the other hand, had no specific goal other than to test its participants to work as a team and endure to the end. Tom Rowland: Now…the big question…what is next? Is Selection in the cards for you? If so or if not….why? JH: That's a good question, but it's one that I won't answer at this moment. The injury on my right leg hasn't fully healed, and it's put into question whether it's worth going through Selection again. After the Triple Heavy, I feel that I don't have to prove myself to anyone ever again. If I ever decide to do Selection again, it would have to be for a very good reason. Jonathan is currently working on writing his AAR for the second Triple Heavy, but you can read his AAR for the first Triple Heavy at the links below. We borowed a good one from my friend Jonathan Hurtado (who actually borrowed this from Dan John before showing it to me). I have done this workout several different ways. There are two styles of kettlebell swings; American which takes the kettlebell completely overhead until the bottom of the kettlebell is parallel to the ground. There is also the Russian Kettlebell swing which takes the kettlebell to eye level. I finished in 25:55 with a 53 lb kettlebell. This one is a favorite because of the way it is laid out. 10 swings is not hard and the pullup is a little break, then it is easy to get 15 and 2 pullups. Most people can get 25 on the first few sets but may break it into 10 and 15 followed by 3 pullups. The set of 50 is definitely tough, but 10/15/10/15 is very doable and then you get to rest. By the time the rest is up, 10 swings are certainly possible, 15 as well. Then, by the 5th set, alot of people are breaking this into chunks of 10s and 15s to accomplish the workout. Soon, there is light at the end of the tunnel and you are on the last set. Training like this is easily translated into every day life and that is a major part of what we are doing at the RRL. Certainly physical training is important, but it is absolutely not the only goal. Mental training is equally important. Overcoming 500 Kettlebell swings at 5:30 am sets the tone for the day and creates confidence and durability. Soon, no task is overwhelming. "Demand more from yourself than anyone else could ever possibly expect"
There is an internet unicorn with the initials SS that I have been following for quite some time. This guy has created and completed some absolutely crazy workouts. He did them in preparation for BUDs training. He has also completed some of the most intense, endurance challenges that I have ever heard of or seen. I have chipped away at many of the challenges that he put on the internet, but there have been a few that loom large on the horizon that I was unsure that I could complete. After doing Marathons, Tough Mudders, SealFit Kokoro, Goruck Selection and many others, I am now finding great fun in simply finding a challenge and doing it right here in my driveway with my friends. Yesterday we tackled one that I have been considering for a long time but refrained for any number of reasons that keep all of us from doing difficult things. Finally, the challenge was accepted and completed. This equates to running 15 miles, doing 600 Burpees and doing 60 Muscle Ups. Mike, PSC, Rusty and Jody showed up and took on this challenge with me. Mike mentioned that he was more nervous than when he was at the starting line of a Marathon, PSC remained confident and I know that I felt like not doing it....about 50 times. At 7:30 am, we started the clock for 99 minutes (the longest the clock allows) and started a slow pace, hoping that we could keep it through the workout. We made it through the first 10 rounds in 30 minutes and started losing a few minutes each 10 rounds, but continued to chip away for 3 hours 30 minutes and 12 seconds for me. PSC finished in 3:19:00 and Mike was in at 3:34:15. The first 30 rounds was a great workout and would fit into a Challenge Saturday perfectly. Getting to 40 was mentally tough, but around round 46, I started to have some demons creep in. Thoughts of not finishing were clearly present but this workout is so beautiful because 1 round is not really difficult so when things got tough...which they did, it was really easy to say, "well, Ill do one more round and see how i feel. The next thing you know, you mark down 50 rounds and start feeling better. After pushing through some very dark places, a second wind is found and I was looking at 5 more rounds. While the muscle ups were getting extremely challenging, I was able to hit every one without failing on the rings. I have never done 60 muscle ups in any workout or even in a day. This is another great thing about this workout. The way it is laid out makes this amount of work possible. To just try to do this work load straight through would be much more difficult for me. Many people ask me why we do things like this. I learned at SealFit the importance of always having goals out there that kind of scare you. Always having something to train for. This keeps us sharp, focused and continually putting ourselves in situations that create discomfort. Pushing through creates confidence, mental toughness and durability. Of all the things that I have brought into my daily life, purposeful gratitude has been one of the most powerful. You can read about gratitude from countless coaches, spiritual leaders, motivational speakers, athletes and other successful people and how it has helped to keep them grounded and ultimately leads to their success. This is not a new concept, certainly not my own and not original. However, it is foreign to many people and overlooked even by some who understand and appreciate it when life gets really busy. The one constant throughout literature, coaching, spiritual texts or actual practice is that it is extremely powerful and responsible for many people's success and happiness. For me, gratitude is an underlying theme that I try to have in my day, every day. If this is a new concept to you, living in gratitude is simply being thankful for what you have right now. It is fine to set goals and have dreams and desires, but without being thankful for what you have right now, those dreams may never be realized. The most simple gratitude practice is something that I try to do every morning. When the alarm goes off, I swing my feet out of the bed and when the first one hits the floor, I say Thank and when the second hits the floor I say You. So I walk to the bathroom to brush my teeth saying Thank You with every step. This alone starts the day off with gratitude and I find it easier to remain grateful for everything through the day. 1. Find a place where you will not be disturbed and set a timer for the time you have set aside for this practice. 6-8 minutes will get the job done, 12-15 is awesome, 20-30 may be a little much at first. I like setting a timer because you can let go of many of the thoughts about being late, losing track of time, or wonder about how long you have been in this state. It may not be necessary for you, but it really helps me. 3. Start with your eyes open and get your breathing under control. Go to a 5 count in-5 count out. This rhythm should be comfortable. As I am breathing, I think about filling my belly full of air at my belly button, then feeling my chest rise, filling my lungs and then ultimately filling up the entire chest cavity all the way to my collar bones and then letting it out feeling all those same parts falling effortlessly back to rest. I go for about 5-10 cycles of this breathing through my nose as long as that is comfortable. 4. Check yourself for tension. I find that if I scan my body from head to toe, feeling for tension, I will notice that I have it in my forehead, behind my ears, in my jaw, and shoulders. I allow those areas to relax and the tension released. I open my hands and give my legs a gentle shake. 5. Start with a small circle around your heart. Think about how grateful you are for your heart and your health. Stay there for a few seconds and think about how your heart is keeping you alive and healthy. 6. Move that circle out a little larger to include your physical body. Be thankful for your health, the ability to move and exercise, grow stronger and anything else that comes to mind about why you are thankful for a healthy body. If you are currently not where you want to be physically, have experienced an injury or are sick, be ultra thankful for your physical body, its ability to heal and the fact that you are on the road to recovery. Stay positive. 7. Move that circle out a little larger, beyond your physical body and bring in the most important people in your life. Maybe this is your wife and children, maybe mom and dad...whoever is closest to you, bring them into this circle and think of them. Be grateful for each of these people. Keep it small right now, maybe 5 people at the most. Be thankful that those people are in your life. See their face, visualize something that they do that makes you smile. Be thankful for them. Be thankful for their health and happiness. 8. Once you have clearly seen the people in this circle, push it out larger to include the next level of individuals in your life. This may be parents, uncles, aunts, cousins, mother in law, nieces, nephews...the next closest group of people. See them clearly and be thankful for them even if it is brief. 9. Push the circle out again and include what you consider to be the next group of people closest to you in your life. This could be your friends, work associates, business partners, a coach, a mentor, whoever that is for you. See them clearly and be thankful for what they ave brought to your life. 10. Push out again to include opportunities. Maybe this is your job, maybe it is the ability to provide for your family. If you are not where you want to be in life, do not think about that. Think only about what you are thankful for. If your job is not what you currently want, be thankful for the fact that you have it. Remain thankful for what you have. At this point, you are probably getting really close to the end of the time you have allowed for this practice. If you find yourself thinking about other things, return to your thought that you were the most thankful for. You can always return to your breath also. Simply go to 5 count breath in, 5 count out. I check my body for tension again and try to shake it away gently if I find any. as I hear the alarm go off, I will lay there for a second and then slowly sit up, open my eyes and gently and quietly return to the world. I find that this practice is so incredibly good for maintaining a positive outlook through the day, slowing down and eliminating the feeling of being rushed, and most importantly puts me in a state of underlying gratitude. It is almost like a computer that is running a program that is minimized. You dont really see it when you look at the screen but it is running in the background. It can be a positive program like this gratitude practice or a negative program like negative self talk, ungratefulness, jealously, resentment, or entitlement. Negative thoughts lead to negative outcomes. Positive thoughts attract more positive. This practice is incredibly important to me and I try to do it every single day. It is not always the same and yours may be completely different in the things that you are grateful for and think about during this time. It really doesn't matter what you are thankful for, just that you are thankful and grateful consciously. This is powerful. Do it every day for a month and I guarantee that you will see major changes in your life no matter where you are or where you want to be. Let me know how it is going for you. Why do we train so hard, every day? Humans need their bodies to operate at peak capacity. It affects everything else in our lives. When we are physically strong, we are “healthy” inside, we are mentally alert and more connected spiritually. In essence we are happier people and more useful to others. We are productive and don’t expect to be taken care of. We contribute more than we take. We serve and love. Everyone seeks this at some level, but most are held down by a system that encourages and rewards mediocrity. Disciplined physical training can set us free from this downward spiral. We don’t need to be an elite athlete or Navy SEAL. No we just need the right attitude and to sharpen our sword daily. We must train for life. Outstanding! If you dont know the Unbeatable Mind Program, seek it out and find it. Some of the best stuff I have ever read. We often do a Gratitude exercise here at the RRL. It is easy and starts your day or week off with an underlying theme of gratefulness and gratitude. Gratitude is one of the most powerful states that anyone can put themselves in. Be thankful for what you have and you will have much more to be thankful for.